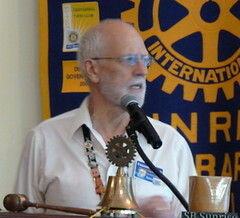 See all the 02/15/2012 meeting photos here. Raffle: Wine and candies brought by Sandy O’Meara. The winner was Jody Dolan Holehouse. Bill Ringer announced it’s time for the 4-way test essay contest. We are looking for a lead for our club. Mentor Program: Diana Cecala announced there is a meeting tonight from 6 – 7:30 PM for all mentors. She will send a reminder email. Dictionaries: Julie Joy Stilwell informed us that labels were made and applied to half of the books. We will have a second labeling session. Deliveries will be made in a few weeks. 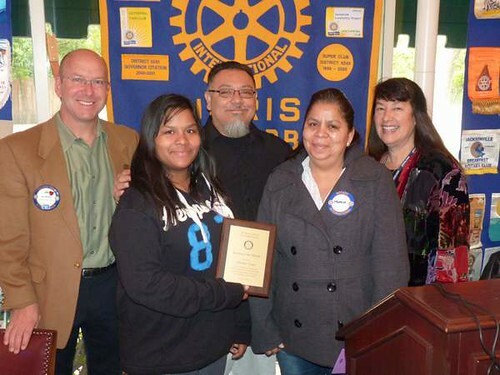 Susan Klein-Rothschild announced that Adriana Lopez is the El Puente Student of the Month. Adriana was described as an exemplary student. Luz Maria Ortiz Smith announced the District Gala is February 26 at the Reagan Library. It is a celebration of the Rotary Foundation. Bill Abel will be attending and is willing to carpool. Find additional information and registration links on a previous Blogle article. The district has a hands on project in Mexico. If we could combine it with the eye surgeries, it might be most exciting. It is also an opportunity to attend the district conference there. Luz Maria will be sending out more information including costs, shortly. 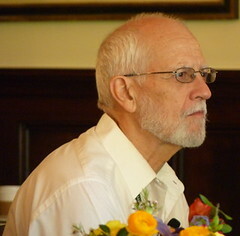 Bob McPhillips announced that we are closing the books on collecting funds for the eye surgeries in Celaya, Mexico. We’ll be contributing more than $1,700. Please contribute soon if you are planning on it. Tuesday Night Rendezvous: 9 people attended last night at Casa Blanca. Golf tournament. Steve Kally urges everyone to take action — start asking people to sponsor, to play, to donate auction items. Watch for a PDF of the brochure in your email. This is the time to seek sponsors. The tournament is on Monday, May 21. Noon for the golf; 5:30 for the dinner. Happy birthday to Laura Benson! 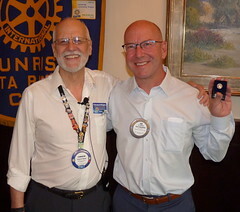 Rotary Lunch Lottery – The new pair is Jill Van Allen and Dana Goba. Scott Burns announced that RYLA is April 19 – 22. They are looking for more female counselors.Sign up to volunteer here. Her grandparents come from Italy, Spain and Greece. Her parents were born in Santa Barbara. It’s a large family. Her father is one of 15 children. Many of those family members had 12 or more children. Delores has 5 children and 10 grandchildren. Her career has been in the field of aviation. She was hired without any background in the field general aviation. She worked her way up to become a manager and airport commissioner. She now makes the connections for the sale of jet fuel for corporate aircraft. There is now a CD that shows the day in the life of an aircraft. This serves as an introduction to aviation. For fun, Delores used to make stained glass windows. She also likes to volunteer for organizations such as Special Olympics and Teen Star. The winner receives $1,000 cash and local schools receive the proceeds from the event. The funds support arts in the schools. Local teens have an opportunity to showcase their skills and support the schools. It’s about the kids and their music. Season 3 is March 3 at the Granada Theater. Deckers and Mentor Corporation have supported the event. Tickets are on sale at the box office.$12 for students. $17 for adults. $30 for good reserved seating. The season 1 winner, Allison Lewis, sang for us.